One of my favorite cookbooks EVER is Mmmmmmm: a feastiary, the first book written by former Gourmet editor in chief, Ruth Reichl in 1972. I was so thrilled to finally get my hands on a copy last spring — Ms. Reichl even did me the immense honor of signing my copy after I asked her very nicely over twitter. 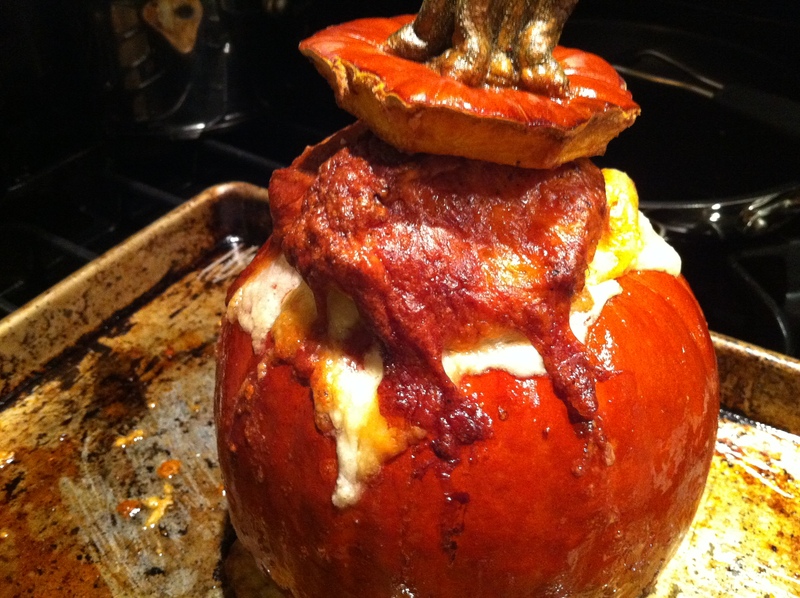 The recipe that immediately stuck out as something I HAD to make, was her pumpkin soup or “Swiss Pumpkin” — I mean it is SERVED in a PUMPKIN, how cool is that?? Preheat your oven to 350 degreees F.
Cut the top off of a smallish sugar pumpkin, as if you were going to make a jack-o-lantern. Scoop out the goop inside, save the seeds to roast! NOTE: pumpkins are REALLY hard to carve… I tried four different knives… nearly sliced my arm off. Watch out. 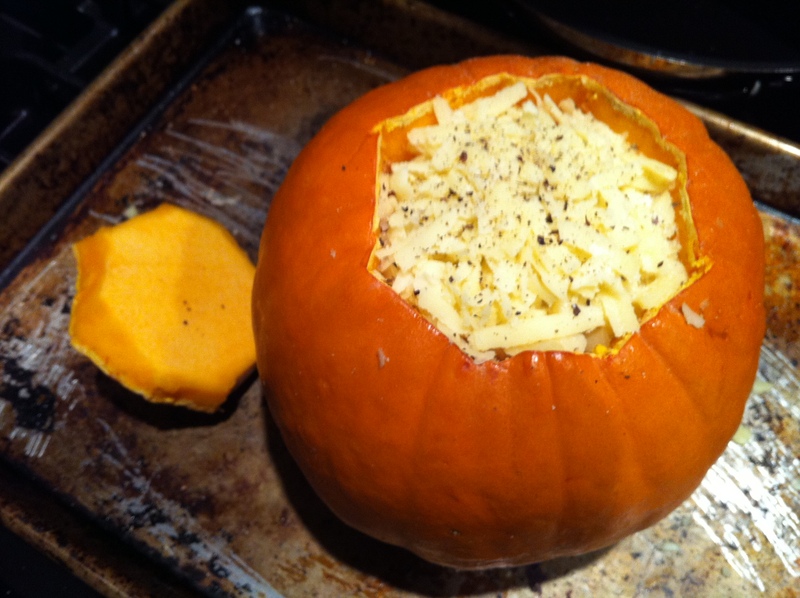 Fill the pumpkin with pieces of toasted baguette, and a good amount of grated nutty swiss cheese — I used gruyere and jarlsberg. 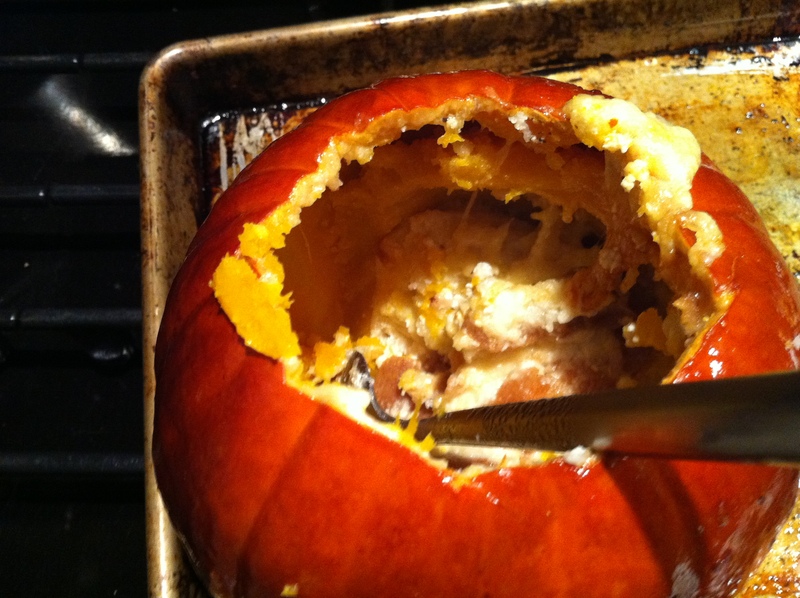 Season with salt, pepper and nutmeg, then fill the pumpkin to the brim with cream. Arteries beware. Put the top back on and bake for about 75-90 minutes. This pumpkin is an absolute beauty when it emerges from the oven — I mean talk about great presentation! Scoop out the cheesy bread along with the pumpkin flesh and enjoy! This recipe was good — but I knew I could make it great. In the culinary world, an ingredient that typically makes everything better is: Butter. And lots of it. So the next evening I set to work. I heated up some chicken stock, threw the remaining pumpkin/cheesy bread mixture into it, added a *bit* more cream, seasonings, and pureed it with an immersion blender. In a medium sized pan, I got a sage brown butter going — simply melt the butter, add the sage, and wait until the butter browns and the sage gets crisp. 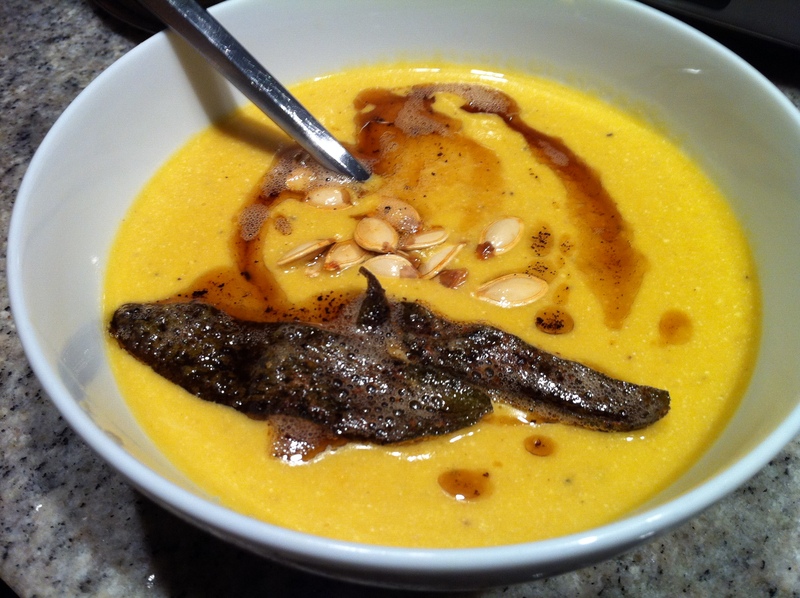 So, here you have it: creamy pumpkin soup with a sage brown butter swirl, crispy sage, and toasted pumpkin seeds. Now THAT is delicious. And somehow even worse for you than a pumpkin filled with cheese, cream, and bread. This entry was posted in Pumpkins and tagged baguette, butter, Gourmet, gruyere, jarlsberg, pumpkin, pumpkin soup, Ruth Reichl, sage. Bookmark the permalink. Love this fun and festive idea. And your addition of fried sage and lots of butter…well, that’s just brilliant! Thanks for including the Jarlsberg, a fabulous cheese to melt into any soup. Thank you so much Casey! I’m so glad you liked the recipe 🙂 The 2 Kitchens are huge cheese fans so I’m sure you will be seeing a lot more Jarlsberg in our posts!